Finished Dead kitty scarf (own pattern) | arlette knits. 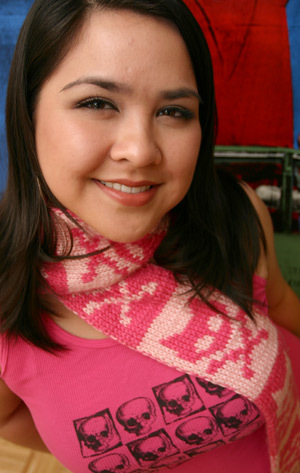 Double-knit scarf with cat head and crossbones pattern, modeled here by my friend Lili. Started August 28, 2006; finished October 27, 2006. Dead Kitty scarf, modeled by Lili Landry. Pattern notes: A birthday present for a friend who still hasn’t received it, even though her birthday was in September. The scarf took forever but got a lot of attention. Everyone from friends to preppy moms to some teen boy on the light rail thought it was awesome. Would I knit it again? I have to, now that I’ve agreed to knit one for Lili.